“My Bike Tour in France Remembered,” by Wayne Slingluff begins in 1968, when the author, then a college student, took off on his own to visit France. Feeling disenchanted with college and worried about the draft, he wanted to have an experience that would take him away from those concerns. Buying a bicycle, he travels over 2000 kilometers. By using a bicycle for a mode of travel, he saves a great deal of money and has more time to truly see the country. As he recounts his memories of each place that he visits, he also includes a great deal of description of how it looks, such as architectural details, and he offers insight into the history. I love that all this detail is included in his memoir. Initially, I wished that he included pictures, but the author explains why he did not and I fully agreed with his reasoning. The story is really a memoir, written as a gift to the artist’s grandson. Knowing this makes his journey seem even more special. I really enjoyed following along as he meandered around the country. He also learned many lessons on the way. These lessons varied from learning how to fix a flat, to learning how to keep your valuables dry from the rain, to learning how to make the most of an experience on a tight budget. He managed to do well with all. The author also gives some insight into why he felt down when he came back to the United States. Ironically, I have a student who just spent three months journeying around Europe. He used modern public transportation instead of a bicycle, so he was able to go further. This student also had a hard time upon his return to the United States. I shared Slingluff’s insights about why this happened with my student and he was totally able to relate to what I shared. 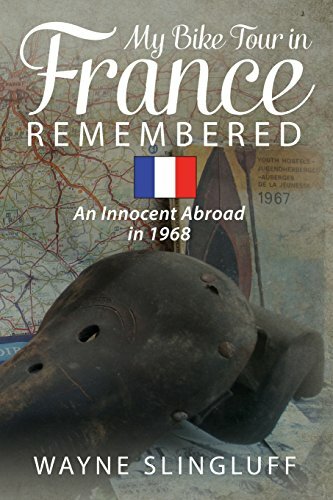 I highly recommend reading “My Bike Tour in France Remembered,” by Wayne Slingluff, especially to armchair travelers who will enjoy being able to sit back and feel like they are on the tour themselves, while staying dry and comfortable at home.